eFiling for Civil Cases in the Los Angeles County Superior Court. *One month free trial period is for CourtFiling.net service fees only. Court filing fees, court technology fees and transaction fees still apply. Yes. In all eFiling implementations, there will be the typical court filing fees mandated by each state’s court fee schedule. Other services, such as credit card convenience fees, or other Court or County mandated fees may apply. Yes. In each state, electronic service works slightly differently, but electronic service of eFiled documents is an available feature. California is known as a hub for technology and digital advancements. That trend is expanding to the Los Angeles judicial system in the form of electronic filing for civil cases. Electronic filing, or eFiling, is the process of submitting your court documents to the county clerk for review and approval. Shifting from physical court filing to eFiling helps bring the legal system up to speed and allow for a streamlined process. CourtFiling.net is proud to be apart of bringing eFiling to Los Angeles. 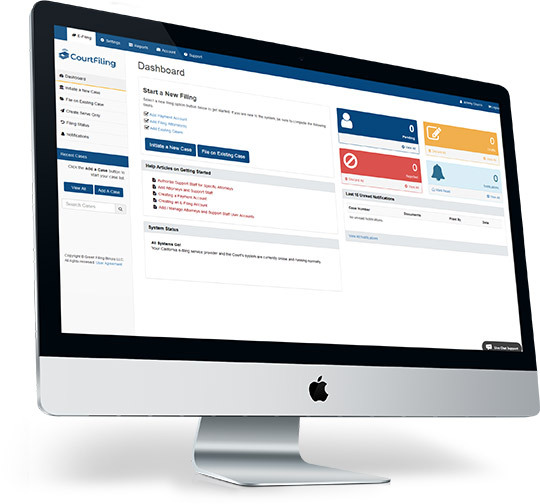 As an electronic filing service provider (EFSP), CourtFiling.net connects filers (whether they are lawyers, paralegals, or self-represented litigants) to the court system in order to file their documents easily through a user-friendly dashboard. While eFiling is not mandatory in Los Angeles Civil Courts until December 2018, it is important to become familiar with the system(s), especially if you plan to eFile documents regularly. Suite 200Los Angeles, CA 90049. If you want easy Los Angeles eFiling, be sure to sign up for CourtFiling.net.